Does your smile need a little help? Are cavities or broken and missing teeth making your life a little less enjoyable every day, negatively affecting your oral health and self-confidence? As a prosthodontist, Dr. Steven Feit has been successfully rebuilding smiles for over 30 years. 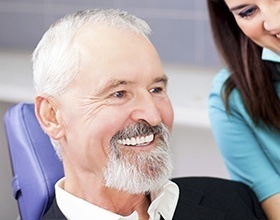 Whether you need a small filling or all of your teeth replaced with dental implants, he can provide the custom-made solution you need using the latest technology and most natural-looking materials available today. With a dental crown, Dr. Feit can make even the most damaged tooth look and feel like new again. It is a tooth-shaped restoration that simply fits over the top of natural enamel, creating a protective shell that is also designed to blend seamlessly within the smile. And, by placing two crowns on either side of a missing tooth, he can also form a bridge to replace one or more missing teeth in a row. 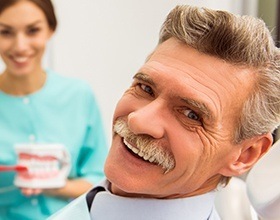 Modern-day dentures are more comfortable, natural-looking, and durable than anything your parents or grandparents might have worn, and when they’re designed by a prosthodontist like Dr. Feit, patients often forget they are wearing a dental prosthetic at all. Whether you are missing just a few teeth or all of them, Dr. Feit can create a denture just for you that will bring back your oral health, function, and confidence at the same time. At this office it is not “just” a denture. 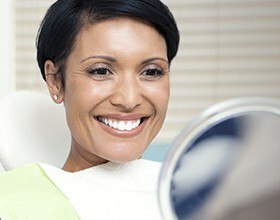 What sets us apart is we use specific specialized techniques tailored to your specific, unique situation based on your smile line, midline, gum shape and size and bite relationship. Simply put, your anatomy and function dictates the best result possible. Thanks to tooth-colored fillings, Dr. Feit can practically make a cavity disappear in just one easy visit to our Boca Raton office. Unlike traditional metal fillings, tooth-colored fillings are made of a composite resin material that can be specially shaded to blend with a patient’s enamel, making the restoration itself practically invisible. Better yet, because they are 100% metal-free, they don’t make a tooth more sensitive to hot or cold temperatures as well. They use a specialized technique that helps make it result in zero sensitivity. When it comes to replacing missing teeth and enhancing function and appearance, nothing does it better than dental implants, and no one does dental implants better than Dr. Feit. With over three decades of experience and countless successful cases, Dr. Feit is exactly the person you want to see if you’re looking to fill in the gaps in your smile. Compared to every other replacement, implants are the most lifelike, durable, and provide the best function, delivering a result that is indistinguishable from nature. 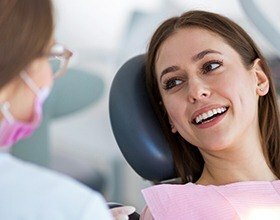 Dr. Feit uses your specific anatomy and bite relationship to make your function the best it can be and your appearance the best it can be as a result. This is what sets him and his surgical team apart.